Cheese is fabulous in all of its forms, but there is something especially delicious about warm melty cheese. Halloumi is a cheese that you can grill and it will hold its shape without turning into a hot mess in your pan or on the grill. Since it holds its shape so well, it's not particularly good in dishes where you need the cheese to melt into a sauce or a pasta. Save this to use in salads, on kebobs or anywhere else you need a slab of warm, grilled cheese. I love the kind of squeeky texture of Haloumi - I haven't found a huge number of uses for it as a cheese apart from frying, but I still love it! I am new to this cheese which sounds wonderful for a tasty high protein sandwich. Ia it purchased in an ethnic food store or a supermarket? I really am interested in purchasing this cheese. Can you tell me where you purchased this cheese. Sorry it has taken me so long to get back to you! 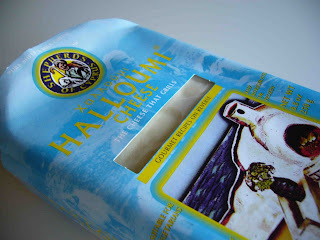 I get Halloumi at a local gourmet food shop, but I also have seen it at Whole Foods if you have one near you. Hope that helps and let me know if you have trouble finding it! I found the cheese at Rainbow Foods in San Francisco Thanks. I love it! Oh goodness. I just heard about this cheese in the past week and then here it is again. Good to know!!!! !